Men’s Multi+Test is a complete vitamin, mineral and energy multivitamin with added men’s virility ingredient Tribulus Terristis. 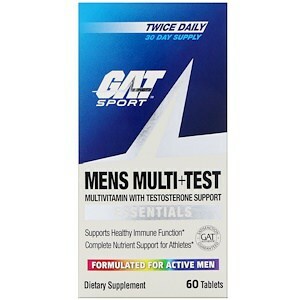 GAT’s Men’s Multi offers athletes complete support for nutrient deficiencies they may need with an added virility and testosterone boost. Citrus Bioflavonoid Peel Powder Complex, Grape Seed Extract, Green Tea Leaf Extract, Spirulina Powder, Blueberry Fruit Powder, Cranberry Fruit Powder, Wild Yam Root Powder, Papaya Fruit Powder, Carrot Root Powder.